We did it! Peanut is officially a whole year old! Part of me is excited, while the other part wants to cry, because my baby is growing up so fast! Height and weight: Peanut weighs 22 pounds, 5 ounces which is less than we thought! She is standing (almost) at 28 1/4 inches tall. Aurora is in the 75% for height, weight and head circumference! Noises and sounds: Aurora is getting better at actually meaning when she says “dada” or “mummu” which is exciting! She also attempts to copy noises and words we make! She also found her head voice (anyone who is musical will know what I mean) she can now hit all the high notes her little heart desires. Milestones: We are officially pulling up on everything and walking ourselves along the coach, or whatever else we can. Aurora has fun pulling things off shelves with her new-found standing. Favorite things: Aurora loves all the usual things, but recently she loves bath time (more than normal), brushing her teeth with mummy, lots and lots of cuddles, and playing with doggies and her friends. Dislikes: Anyone telling her what to do seems to cause some drama. Also, trying to get her to sleep when she wants to be awake is struggle. Silly baby! 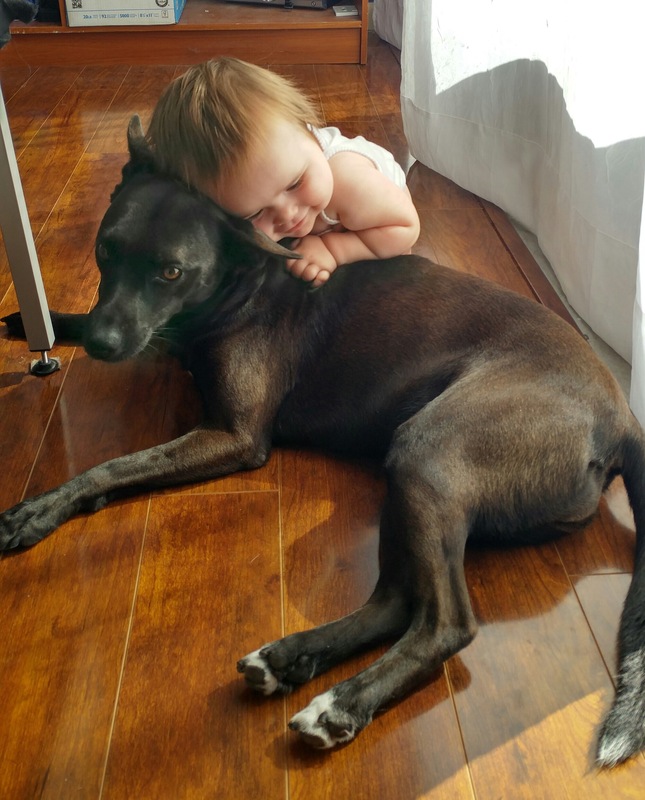 Naps are a good thing! Fun Things: Since we are officially one, that means we got to do a smash cake photo shoot with Aurora. We went with Princess Aurora themed and had a blast letting her attack a cake and and cover herself in blue icing. This weekend we are throwing her a TMNT birthday party, masks included. It is outside at a little park on the water and it is going to be lots of fun I’m sure. For her birthday, we bought her a Rockabye rocker. It is a purple dragon named Puff. She loves it! It sings a few songs and she is getting the hang of rocking it. Her feet don’t touch so we have to help her get on Puff…but she loves it all the same! Mummy’s favourite moment…well…there are just too many to count. I loved watching her unwrap her dragon rocker, crawl to me in the middle of the night for cuddles, watching her reaction after trying icing for the first time, and I cried a little seeing her all dressed up and looking beautiful for her photos. 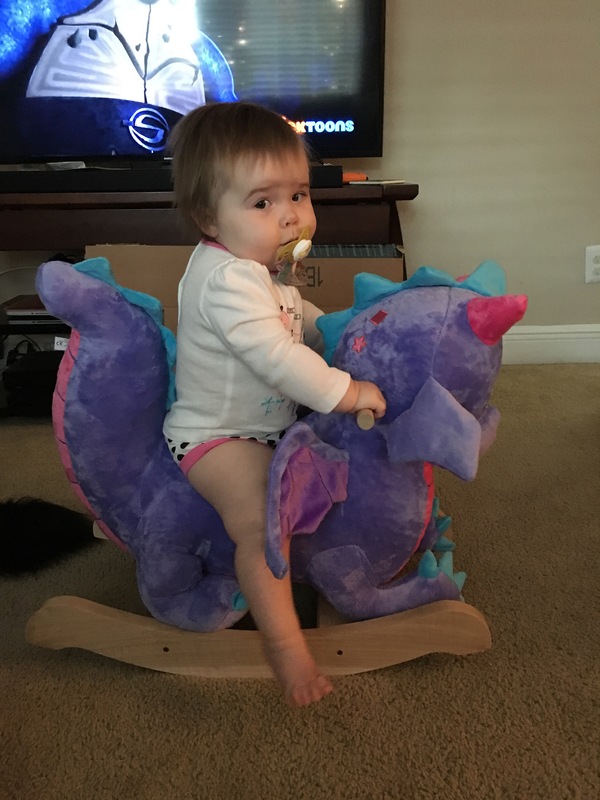 Daddy’s favourite moment was when Aurora unwrapped Puff (the purple dragon rocker) and rode it for the first time. The look on her face was priceless. You could see the genuine happiness on her face. Daddy also loves that spending Fridays at home with the peanut, and all the cuddles she gives him throughout the day. I just can’t believe how quickly that last year has gone. Our sweet baby went from this fragile little newborn to a beautiful, loving, cheeky little toddler in the blink of an eye.